Epiblast cells are columnar epithelial cells. 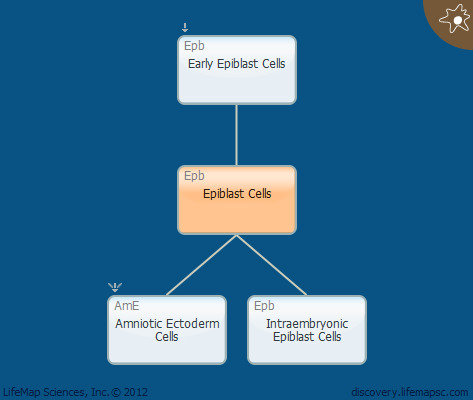 The epiblast is subdivided by small clefts that eventually coalesce to separate the intraembryonic epiblast cells from other epiblast cells which form the amniotic membranes. In the mouse, epiblast cells are dorsal to the hypoblast cells and begin to migrate and proliferate to form the primitive yolk sac. An extracellular basement membrane lies between the hypoblast and the epiblast. NANOG is a hallmark epiblast lineage marker. The ground state of the early embryonic cells lasts until late blastocyst stages (up to implantation, equivalent to day 7 in humans, E4.5 in mouse). Epiblast cells from later stages are considered primed cells, no longer defined as ground state. Among other differences, they are no longer capable of developing chimeras (in ex-vivo experimental conditions) and cells in female embryos will have an inactivated X chromosome. It is argued that most human embryonic stem cell lines are derived from the primed cell stages, correlating to the later epiblast stages (postimplantation) and not to inner cell mass and early epiblast ground state cells, as previously thought.